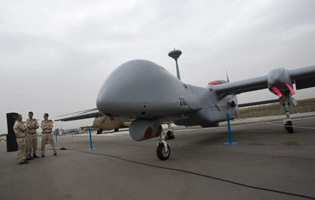 A new drone that can remain airborne for more than 24 hours and reach as far as Iran was added Feb. 21 to the Israeli air force's arsenal, the military said. Described by the army as a "technological breakthrough" the Eitan - which means strong in Hebrew - is a Heron-TP type drone with a wingspan of 26 meters (85 feet), similar to that of the Boeing 737. It is 24 meters (79 feet) long, weighs 4.5 tons and can remain in the air for more than 24 hours, enabling it to fly as far as Iran, Israel's arch-foe. The drone was built by Israel Aerospace Industries in cooperation with the air force and is equipped with radar, cameras and high-tech electronic equipment including mapping devices. The drone can reach an altitude of 13,000 meters (43,000 feet) and carry payloads of about 1 ton. "This aircraft constitutes a very important turning point in the development of unmanned aircraft", Air Force chief General Ido Nehustan was quoted as saying.